This Checklist provides the best "Recipe" for improving your Restaurant's operations - Easily and Cost effectively. Introduction: This Checklist a powerful self-assessment management tool that an owner or manager can efficiently utilize to conduct an operational evaluation of their Restaurant. 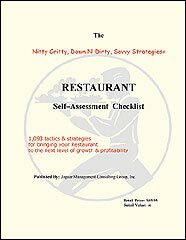 The Restaurant Self-Assessment Checklist has over 1,300 different tactics, strategies, and action items to be considered and evaluated - - all organized in a logical, easy-to-use process that features thirty (30) different profit-producing modules ranging from Restaurant Image to Customer Service to Operations management! The evaluation process is NOT one of those "simple" or "quick and easy" assessments that result in a cursory overview, provides little or no direction for improvement, or is a "complete waste of your time and money". Instead, the evaluation process is quite thorough, provides a careful, thoughtful analysis, and identifies numerous opportunities for improving your Restaurant's operations. For ONLY a small investment of $97.00, this Checklist is designed for the serious business owner or manager who truly desires to evolve their Restaurant to the next level of growth and profitability! A low-cost investment of ONLY $97.00 with a high-yield ROI and includes Instant Download after Credit Card Verification! The Restaurant Self-Assessment Checklist comes with a No-Questions-Asked, No-Hassle, THREE MONTH MONEY BACK GUARANTEE. If you honestly feel that if after applying this Checklist to your Restaurant business it hasn't helped improve your Restaurant's operations, hasn't helped improve efficiency, hasn't saved you time or money, and hasn't made you a more profit oriented Owner or Manager, then just return the Checklist PDF (and all copies) by email anytime within the next 90 days and we will refund the $97.00 you paid (NOTE: This guarantee is for restaurant owners or managers ONLY - - no refunds for consultants, students, educators, or curiosity seekers). Satisfaction Guaranteed!